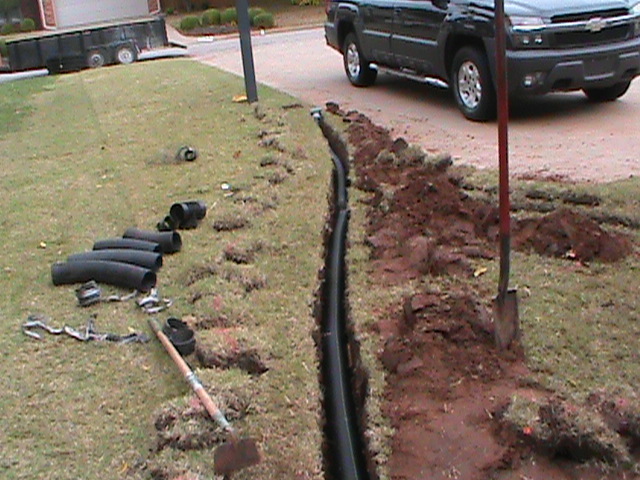 Drainage Problems, French Drain, Surface Drain, Oklahoma City, Edmond, Norman. Too much water is never a good thing! CMG can quickly diagnose your Drainage Problem and provide a free quote for a Drainage System. With twenty years of experience, we realize that Drainage Problems may be very complex and difficult or very straight forward and simple. Every Drainage Problem is unique to a certain degree. Don’t kid yourself, Experience Counts! 1. What is the Primary Water Source to the problem? Where is the water coming from? 2. Is there a Secondary Water Source? Other Places that water may be coming from. All Drainage Problems have more than one source! 3. How many Subsequent Water Sources are present? Some complex Drainage Problems have many water sources. going to be released? Is more than one exit point possible to increase capacity? These are just a few of the considerations for any Drainage System Diagnostic. Three Gutter Downspouts in the front yard were connected to 4 inch ADS solid Drain Pipe with Large Drainage Gutter Connections. Three lateral 4 inch Pipes were run from each gutter to one outflow pipe moving the water to two exit Pop Up Emitters. One of the Drain Pipes ran under the sidewalk to reach the Exit Drain Pipe. The back yard Exit Pipe then connected to 55 feet of 4 inch French Drain that was installed along the SW corner of the house. The French Drain provided a protective barrier for that room of the house where water had previously been leaking into the floor vents. Two Gutter Down Spouts were also connected in the back yard to the Drainage System. A few days later a heavy rain came in. No water stood on the sidewalk near the front door, and nor water seeped into the floor vents in the back bedroom. CMG works closely with our customers. We provide all the information we can to help the customer make a decision that will solve their Drainage Problem. Typically, Drainage Systems are made up of one or several types of Drains. CMG utilizes French Drains, Surface Drains and Trench Drains when designing Drainage Systems. There are many types and sizes of Surface Drains and French Drains. Again, experience is the key!